After four years of playing EVE it’s actually difficult to impart how much of a ground breaker the Shadow of the Serpent event is in terms of PvE in EVE Online. Of course it’s nothing new in terms of the MMO world, but it is the first time CCP has tackled a PvE event of this type – ever. Sure there has been some test runs in the forms of Frostline, Guristas, Blood Raiders, Upwell events, and of course the ‘a rat a day keeps skill injectors away’ opportunities. But Shadow of the Serpent seems to be the culmination of these events based on the foundations that were laid by the previous events. PvE is notoriously grindy in EVE, missions, anomalies, incursions, all essentially the same ‘do something collect bacon’ with a chance of some swanky loot. All of these activities are not prompted by the game in some way, you, the player have to choose to do them. This is probably the source of its greatest strength, and greatest problem. Players don’t feel the need to complete PvE, indeed, (some players don’t even do PvE at all) but at the same time there is no driver to maintain PvE activity in EVE. While EVE has a mind boggling variety of PvE activities, over a long enough timeline these activities get old and boring. One level 4 mission or anomaly in one part of space is almost exactly the same as any other. These sorts of activities simply become a grind to pay for the replacement PvP ship, or to upgrade to a better grinding ship and so on and so forth. This usually means one of two things will eventually win out – the ultimate goal will be met, or you burn out. If I take my own personal habits I usually swap activities every 2 to 3 months. I am pretty sure if you look across the majority of the gaming world you will get a similar pattern. But people not doing things in EVE is fundamentally bad for the game – if ships are not in space the universe slowly, but surely, comes to a halt. So, in order to keep people engaged in PvE activities, things need to be shaken up every so often. This activity in zoological circles is commonly referred to Environmental Enrichment. Zoo keepers will regularly switch around and change animal enclosures with new and different things to keep the animals engaged. It has also show to have some very positive benefits in improving animals mental capabilities, comfort, and health. In short, it keeps them happy. While naturally I am not suggesting there is any direct parallel here to a Zoo’s inhabitants and EVE Players, the same principal applies, particularly when it comes to repetitive activities. At CCP the zoo keepers are Team Astro Sparkle which is fronted by CCP Paradox and CCP Affinity. Their jobs are to enrich the universe of New Eden to keep us engaged. 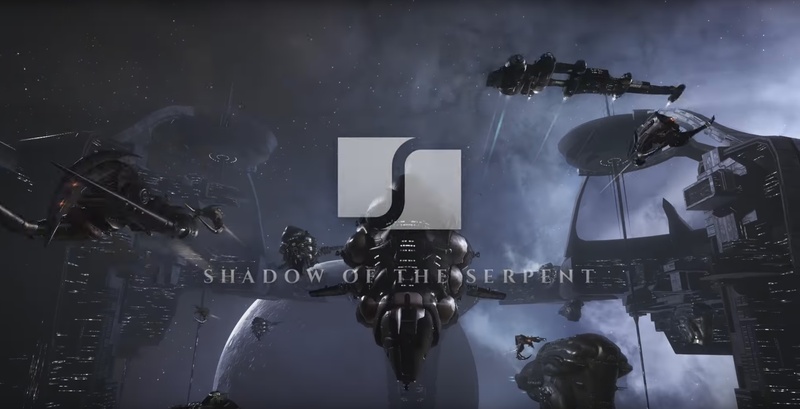 The net result of nearly a year of their work and events run so far is the the Shadow of the Serpent event, and it has shiny new novelty painted all over it in the Black and Chrome colours of the Serpentis. The event breaks some normal conventions of EVE PvE, it is not not just a simple ISK grind or loot hunt, although these are still elements of the event, they are not the main driver. The main goal of this event is an opportunity to obtain something that (when fully implemented into the appropriate loyalty point store,) only a few select people will have access too. This is a powerful incentive and is by far one of the best ways to encourage people to get involved. Personally I no longer need to grind in game for ISK, I obtain it via my writing for EVE websites, but this event has given me the opportunity to obtain some ship SKINS and my first rare capital ship. It was too good to pass up. The second and newest part of this event is the Scope Network Challenges. The Scope network interface gives you a series of challenges that need to be completed in order for you to achieve your goal. In this case reach 50,000 points and get the gold box. The Scope Network Challenge is pride of place on the log in screen, it’s there all the time at the top left of your UI, it loudly proclaims that ‘you can do these things and be rewarded’ and provides them in an accessible format. This is entirely new, never has EVE put activities in front of you and actively invited you to take part. More importantly, it feels like an event, it’s something to be excited about, something to log in for. There were the lore elements released on the in-game news section of the website, we had a sneak peak at the ships at fanfest, a swanky trailer, a couple of scope videos all building up the hype for the eventual release. So good so far right? The fundamental ground work here for this event is tried and tested. The visibility and accessibility is there, but what is it like for the people taking part in it? Well, if we are honest, it’s pretty mixed, but that again is to be expected. I can’t really speak for other peoples interactions with this event as much as I can for my own and so that is what I will do. Coming up to the launch of the event I was pretty excited, promises of the Serpentis skins (anyone who knows me will know my maddening addiction for unique skins) was one hook, the second hook was the opportunity to obtain those capital BPC’s – I wanted that Dreadnaught at least, the Nyx or Titan BPC would also be a nice bonus. But as details of the ships started to come out and details on how you were able to obtain them, some early criticism started floating around. First off was pricing – The Vehement (Dreadnaught) was coming in at least ~40bn ISK to build, the Vendetta (Super Carrier) is looking at in excess of ~120bn ISK, the Vanquisher (Titan) was coming in at a whopping ~400bn ISK. Note, that’s build cost, not estimated value. This smashed all previously set out conventions for build/price ratios for pirate faction ships. Pirate faction ships can command premiums of over 10x their build value for frigates going up to 3 or 4 times for the battleships. This is pretty commonly put down to the fact that the increased costs is all down to loyalty point grind required to obtain them and the difficulty in obtaining the appropriate LP. Have you ever tried to obtain LP for a faction battleship from running the missions in NPC nullsec? It’s a hairy experience and again a very long grind. Those who control the level 5 mission agent systems can pull in tens of thousands in LP per mission, but need to be willing to put some serious hardware on the line for it. Of course if you are in a group organised enough to ‘control’ the space then life is a lot easier but still fairly risky. Even so, to obtain a faction battleship you are looking at maybe a dozen level 5 missions or 200 level 4 missions. No small order. So CCP uses loot drops in exploration sites and anomalies to offset this. Otherwise there would be a huge bottleneck in supply. Remember when faction battleships were all nearer to the 1 billion isk mark? Indeed the majority of faction pirate battleships now come from loot drops in nullsec sites and exploration sites rather than the mission running. The Developer blog from CCP indicates that the Serpentis capital ships will be implemented into the Serpentis LP store, there is no mention of drops. So these capital ships will, quite rightly, command a huge LP premium on their build costs. 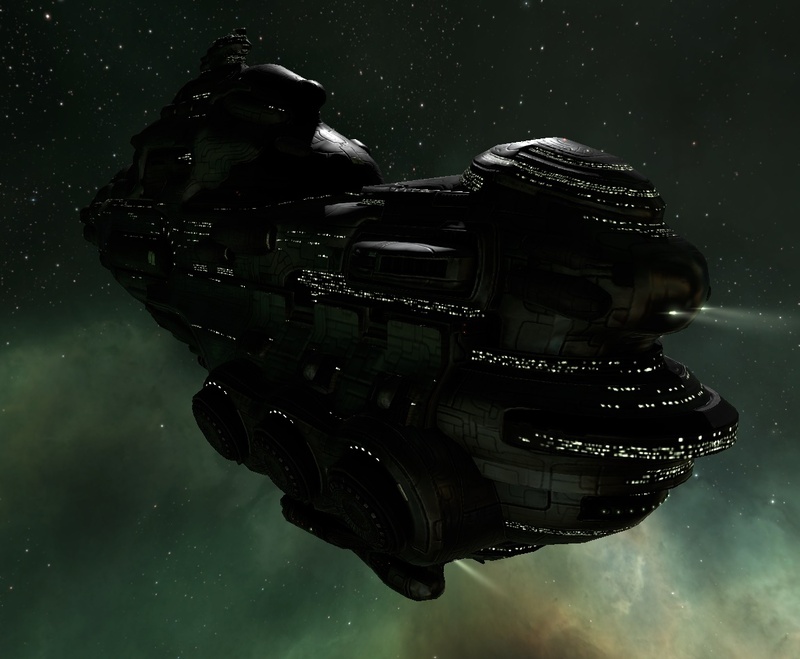 The Vehement alone is 16x the build cost of a Moros (around 40bn ISK). Add in special components (chips) and LP costs this could end up being a significant amount. Your average pirate faction battleship for example is worth 800,000 Loyalty points which commands a wide range of values from 400isk/lp to 1,000isk/lp. We don’t know how much these capital ship BPC’s will be so estimating how much they could be is at this moment in time an impossible task. Indeed, the only example we have at the moment is the Revenant (first pirate faction capital ship) which drops from Low Security Incursions. The build cost is in the region of 20bn ISK which is the same as normal supercarriers. But, due to their rarity they command an asking price of around 100bn ISK or 4-5 times the build cost. 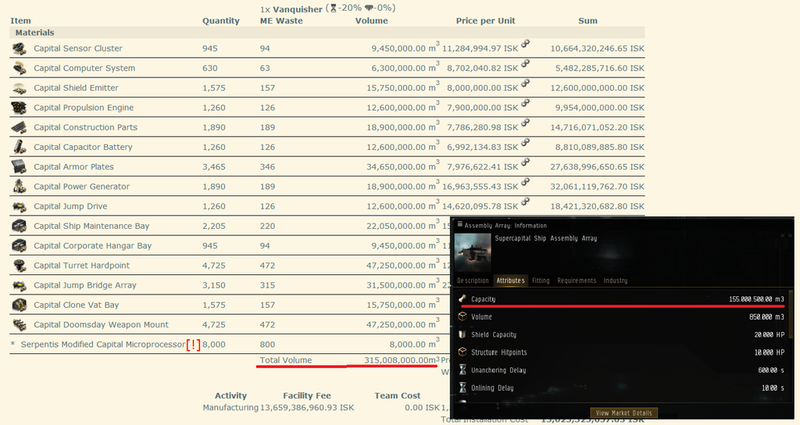 The Serpentis Supercaptial – The Vendetta, is 120bn ISK just to build! A post also landed on reddit just as this article was being finished that the Vanquisher cannot be built as the total volume of all the components is greater than the capacity of a Supercapital Ship Assembly Array. So it begs the question as to what the design decision behind the build values of the Serpentis capitals? Of course you will have people who are willing to put that sort of money down, someone always has the money, but stepping away so radically from the precedent laid out by every other faction ship seems odd. While the Vehement BPC will be available to everyone who manages to achieve 50,000 SCOPE points before the end of the event, the Vendetta will only be available to the top 10th to 6th highest point accumulators. The Vanquisher will only be awarded to the 5th and 1st. This has been met with almost universal complaint from the general EVE player base as it puts a huge emphasis on people who have the most available time to grind for the points and immediately alienates those who don’t from the event. Those who have the ability to run sites continuously or those who are willing to be able to put their lives on hold would ever stand a chance to obtain these blueprints. I am of course referring to the people who managed to raise 50,000 points in less than 5 days, some of whom have now broken the 140,000 point mark. Could there have been an opportunity here to encourage more participation by making the rate at which these BPC’s are rewarded as random? It is again a odd decision. Here was a chance where that maybe, just maybe, you could have gotten your hands on an ultra rare BPC which has been removed, it also removes some incentive for the event at the same time. Of course I would be remiss not to mention the other rewards in this event, in which we see a set of themed Serpentis SKINS for Gallente ships and the Cerebral Accelerators also make a return from the Bloody Harvest. 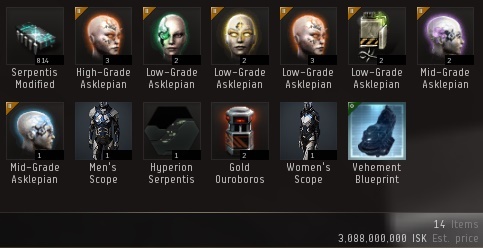 The SKINS themselves are a welcome addition, and certainly for a SKIN collector such as myself as some of the rarer SKINS from previous events command impressive premiums (the permanent Gurista Cormorant SKIN is currently selling for in excess of 3 billion ISK!) The popular Cerebral accelerators also make a return, but as does their unwelcome expiry dates. And so, after almost 2,000 words I finally get to the actual event itself, and the result? After just over two weeks, with just over 80 hours of grinding sites, the end result was my Gold Oroboros. My total rewards for the entire event? Adding this all together this brings the grand total in game asset wise to about 5.2 billion ISK. For 80 hours worth of grinding that works out at around 64m ISK per hour. That would be equivalent to nullsec ratting in a battleship. So overall the reward vs time balance of this event seems to be spot on. You do however have to consider that the values are subject to massive change as we are not yet halfway through the event prices are hugely volatile. I was actually, quite surprised by this. It didn’t feel like I was grinding out 5bn ISK. Why was this? In my 4 years of playing EVE I have been trained that if you blap this you get loot or ISK. While often its not immediate, there is a constant reinforcement in the shape of blinking wallet. And so we move on to this event and its main form of reinforcement of progress is the points system. Sure you get some loot and bounties, and I will admit getting a High-Grade implant was a nice pick me up after I had been jumping from system to system to system trying to find the sites I needed, but I felt somewhat detached, my expectations were, initially at least, to smash red-cross, get bacon. So there was an initial adjustment period that I actually had to train my brain into. This wasn’t running sites for bounties, it was to clear them as efficiently as possible. Once I had worked this out and let go of some of my preconceptions of what a PvE event in EVE is I found my flow. But, despite this the new point system is also one of the great successes of this event. Everyone who was in a site at the time of its completion got the point reward for it. Sure you got reduced bounties, and you had to maybe fight for the loot. But if you and some friends wanted to run the tasks you could and you wouldn’t feel like running sites with other people was detracting from your goal, you would all be equally rewarded for it. So it encouraged co-operation between players in a way that I hadn’t seen for quite a while. Impromptu groups would form and run sites together. I even recognised some players simply because they were in the same area at the same time and often found ourselves running sites together. 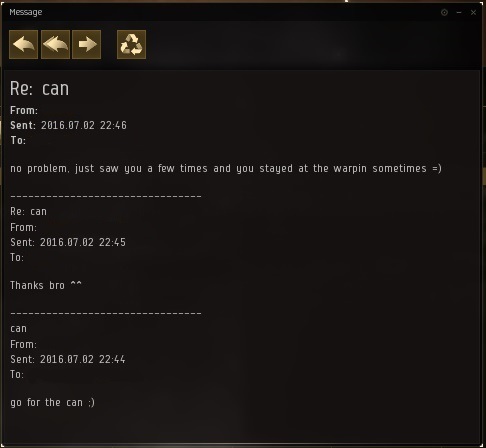 Indeed in one instance another player contacted me in game and said – take the can, I have taken the last few. I have, honestly hand on heart never seen this sort of behaviour before and it was kinda refreshing. We subsequently ran into each other again a few days later and carried on running events. But I did hit some frustrations. While the sites and tasks themselves were mostly straight forward there were some which ended up being a huge waste of time. As I had geared myself to obtaining points in the most efficient manner possible these tasks ended up being ignored and rather than enriching my experience by providing some veriety they only detracted from it. Prime example of this was the find x number of guards in a frigate task. I went out, bought a frigate and then proceeded to fly through over 30 jumps for a couple of hours looking on gates and in belts to try and find these elusive guards. In the end I gave up simply because if I had stuck to the main Shipyards and Research facility sites I would have easily made more points than that single site was worth on its own. The second, and perhaps the most fatal of all when it came to the tasks was the imposed time limit on them. After a task was generated would last for a certain amount of time before a final 24 hour countdown clock began. I never quite worked out what set off the countdown timer, only that it would start for one of the four tasks you had after a 24 hour period as it seemed to arbitrarily tick down for tasks I had not started and for ones that I had begun. There was one task that required completion within 24 hours, but that was an exception to the rule. Tasks I hadn’t started were not an issue, the tasks I had started running was. At one point I had a task start counting down on me after I had found and run 8 out of the required 10 sites for 1,000 points. After some quick calculations I discovered that if I didn’t complete the final 3 events that evening the time I had spent completing as much of the task as I did would have been wasted. So, at 11pm on a week night, knowing that in 7 hours I would be getting out of bed for work the following day I stayed up until 2am trying to find the final elusive 3 sites. It was maddeningly frustrating. To echo my sentiments of this event entirely when streaming a friend of mine hit a time limit on a task he had been set and failed a task. His response was to quit (skip to 4 hours 40min). While I understand the reason for switching the events I don’t understand the enforced time limit as much as just giving the player the option to re-roll event every 24 hours. So after 80 hours I achieved my goal of obtaining the Gold Oroboros. I didn’t feel the need to grind any further thanks to a run in with DoPa who quite casually told me he was on his way to hitting 140,000 points and there was no way I was going to complete with that. Was running this event worth the time? I think this is mostly subjective to what you want to get from it. For me it was a new thing to do, something to get my teeth into and the rewards were totally worth it in my mind. Would I want to rush and do this event again any time soon? Probably not for another 3 months no, I’m pretty burnt out on it and I am looking forward to getting back into some sort of normalcy. Are there things that need changing, definitely. Some of the frustrating tasks need to be removed along with that god awful time limit of 40 days (2 or 3 months would probably be a nicer amount of time) and finally, give everyone a potential chance to get one of the higher tier rewards and I think CCP will be onto a winner. Now, time to start poking alliance mates to see if they can’t run me off some capital component BPC’s and see about raising the remaining 25bn of the 45bn I need to build this Dred…. BChGIA Really appreciate you sharing this blog article.Really looking forward to read more. Really Great. tema da blogging. Você tocou alguns boa fatores aqui. I’m locating them for my sis. I’m trying to find the most recipes with images as well as the ages of infant for the dishes. Blogs are typically where I would certainly anticipate to discover them. What are the most popular blog websites in the Philippines where I can send my blog sites for others to review? Olá lá , gosto de ler através de o artigo . Eu queria para escrever um pequeno comentário para apoiar vocês. Hey! I know this is somewhat off topic but I was wondering which blog platform are you using for this website? I’m getting fed up of WordPress because I’ve had problems with hackers and I’m looking at alternatives for another platform. I would be awesome if you could point me in the direction of a good platform. I am not certain the place you’re getting your info, but good topic. I must spend some time learning much more or figuring out more. Thank you for great info I used to be looking for this information for my mission. I was recommended this website by means of my cousin. I am not certain whether or not this put up is written through him as no one else know such designated about my problem. You’re incredible! Thanks! What blog site websites would be good for a small business in flower and gifts? Hi there would you mind letting me know which web host you’re working with? I’ve loaded your blog in 3 completely different web browsers and I must say this blog loads a lot quicker then most. Can you suggest a good hosting provider at a honest price? Kudos, I appreciate it! I keep listening to the news update speak about getting free online grant applications so I have been looking around for the finest site to get one. Could you advise me please, where could i find some? Hello my family member! I want to say that this post is amazing, great written and come with approximately all important infos. I would like to see extra posts like this . Good write-up, I?¦m regular visitor of one?¦s web site, maintain up the excellent operate, and It is going to be a regular visitor for a long time. Actually my blog site name is not pertinent to my blog site niche. in this time i want to transform my blog to a site via blog owner. however i don’t know if i will do it, then how much will influence my blog traffic?.